The last time we came to Ray’s Rest, in January 2017, we ended up leaving a few hours after we’d arrived. A storm was forecast that night, and though all was calm when we arrived, by nine o’clock that night rain was hosing down and a driving wind was making things extremely unpleasant. 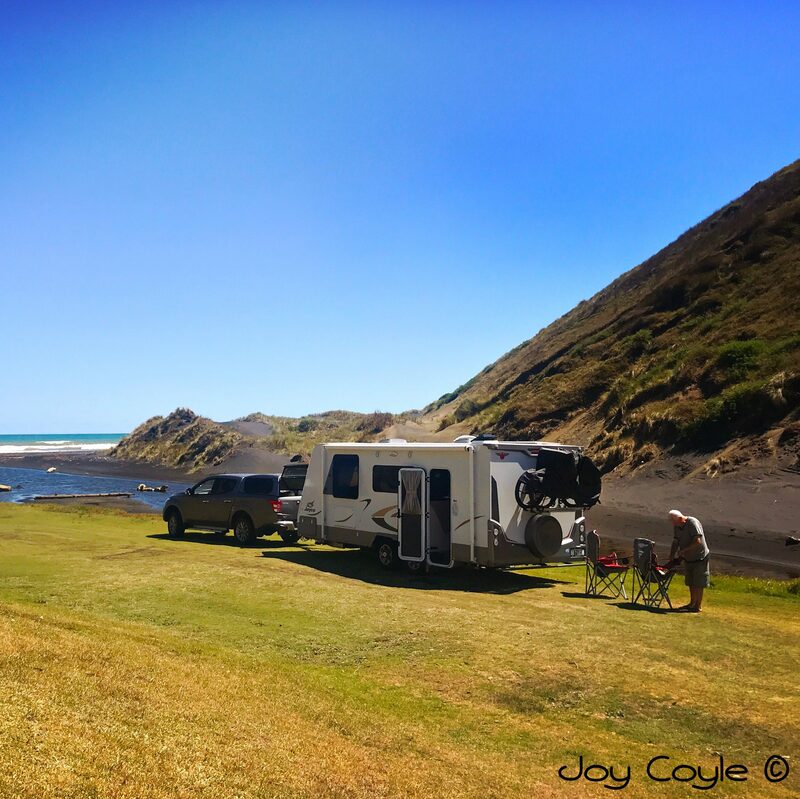 We tried moving the motorhome (as we had then,) but there was no getting away from it, it made no difference, and by 10 pm we decided to leave and drive to Paeroa. This time it couldn’t have been more perfect. We arrive mid afternoon having driven down from Auckland. As soon as we get out of the ute, the first thing to hit us is the absolute silence. The tide is out and the quietness is palpable. It’s actually quite breathtaking. Ray’s Rest is about 4.5 kilometres south of Kaiaua village, roughly halfway between Kaiaua and Miranda on the western side of the Firth of Thames. I wonder how it got it’s name, but think I’ve read somewhere that Ray was a drover, and that this was where he rested both himself and his stock, enroute to wherever he was headed. The Seabird Coast extends from Kawakawa Bay at the northern end, to the vast mangrove forest at the southern end of the Firth, near Thames. They’re super crunchy to walk on. Arriving at the end of the reserve I discover that what looked like a sandy spit is very muddy when I try to walk on it. Thick mud sticks to the bottom of my jandals (thongs, flip flops), so I give that idea up and wander back. The tide is coming in anyway. Up to 20,000 migratory seabirds and waders can be observed during peak seasons here. The area is well known for it’s godwits which migrate in huge flocks to and fro between New Zealand and Alaska. We decide we have to have fish and chips from Kaiaua Fisheries while we’re here. The recommendations are too many to ignore. …and they are so delicious! Certainly live up to their reputation. We slept well with just the sound of the waves rolling in. There’s a natural rythmn to life on the coast. We’re enjoying the peacefulness and decide to stay a second night. (A maximum of two nights is allowed). Waking up just before sunrise to enjoy our first cuppa sitting out on our caravan step with this view is just magical, and we feel very privileged. And looking out through the door. Amazing! The Pukorokoro Miranda Shorebird Centre nearby promotes the ecology of this important area and it’s flora and fauna, and seeks to raise awareness of the shorebirds and their ecology. No dogs are permitted in the area, on or off leads, and all campers must be fully self contained. There are no toilets or other facilities at the reserve and camping areas are sign-posted. … I get the feeling it’s a regular outing for them. It’s well worth a stop-over here, even if you’re not a bird watcher. The peace and tranquility of nature here is restorative at the very least. Thanks Cliff. Yep it sure can.